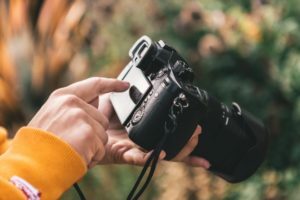 Amateur photographers who visit Moore Farms Botanical Garden between April 26 and May 4 are encouraged to enter their best shots of the garden into MFBG’s new Garden Visions Photography Contest. Entrants may submit one photograph in each of the contest’s four categories: Garden & Landscape; Macro (extreme close-up); Garden Accents & Oddities; and Critters and Creatures. There is no cost to enter the contest, and all ages may participate. Photographers can submit only one photograph per category. All photos must be taken within the boundaries of MFBG. Entries must be submitted by 6 p.m. on May 4. Judges will select a first- and second-place photograph in each category, plus an overall General Excellence winner. From among the first- and second-place winners in each category, a People’s Choice winner will be chosen by MFBG’s social media followers. “Garden Visions is a great away to cultivate amateur horticulture-related photography; to document the garden, landscapes and outdoor living spaces gardeners are inspired by and care for; and to showcase the garden on a broader scale by strengthening awareness of Moore Farms Botanical Garden and enticing people to visit,” said MFBG Event Coordinator Leigh Collins. Winners will be announced May 9 on MFBG’s social media platforms. Garden Visions coincides with ArtFields, Lake City’s nine-day, juried art competition. MFBG will be open to the public for free from 8:30 a.m. – 3 p.m., April 26 – May 4, excluding Sunday, April 28. Photographs must be submitted digitally to photographycontest@moorefarmsbg.org. Photographers must send one email per entry. Email subject lines should follow this format: Entrant’s last name, photo category. JPEG image files should be submitted at the highest quality compression allowed by the camera or smartphone at a resolution of 300 dpi. Minimum is 2408 x 3508 pixels; ideal is 3508 x 4961 pixels. Standard optimization techniques, such as removal of dust, cropping, saturation and sharpening are allowed. Other optimizing techniques such as combinations of images and compositional changes will result in disqualification. No copyright marks, logos or photographer names should appear on any image.